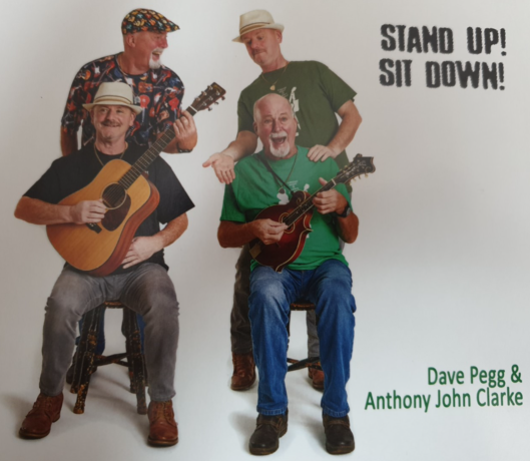 Over the last seven years Anthony John Clarke has been presenting, with the help of folk rock legend Dave Pegg, his wonderful songs playing folk clubs throughout the land on their annual mirth and mischief tour. Songs full of whimsy, gentle (and not so gentle) humour, pathos and beautiful imagery. Shows that are very intimate, the talent AJ and Peggy have in performing to crowds that are, or will become by the end, mates and friends, is infectious. The lads have now been in the studio to record 10 of their favourite songs that they’ve been performing over the years with the album, Stand Up! Sit Down! being released and available. And it is a brilliant trick that has been pulled off with this studio album retaining all the charm, intimacy and inclusivity of the live performances whilst adding just enough polish through excellent production by Mark Lee, at Blue Moon Studio, and Mark Walker. The real stars of this album are, of course, the songs. Written by AJ and Julia Porter, some are wonderful vignettes of the trials and tribulations of growing older, with Life in the Old Dog Yet a particular favourite; the line about it being easier to find an electric blanket than an erogenous zone is typical of AJ’s self-depreciating humour. Others are more reflective of youth, looking back from the perception of lifetime experience remembering concerts seen many years hence. But all are beautiful, backed by exceptional playing from both AJ and Peggy, whose range of musical ability is unrivalled across not only bass, but also guitar, mandolin and percussion as well as his harmony singing. Added to the musical accompaniment are piano, strings and percussion from co-writer Julia Porter, clarinet from Adrian Black and chimes from Mark Walker. This album is a moment of sheer musical joy wrapped around stories told in a gently hilarious and pithy way. As I sit here writing this review on an overcast Sunday morning in early spring, coffee to my left and a snoring dog to my right on my sofa Stand Up! Sit Down! plays as a perfect accompaniment. Full of mirth and mischief this collection of ten songs is just the album to ease the listener gently in to their day. A collection that is a brilliant introduction to the unique world of AJ and Peggy and well worth a tenner and a bit of anybody’s hard earned cash. A must have for fans and newbies alike!